What could be better than spending time with family or friends on a warm summer night? Remembering those past adventures you shared together, laughing about all the crazy things you have done, and sharing new memories in the making. That is one of the best parts about summer, right? Almost everyone has at least one great memory of sitting around a campfire at some point in their life. These days almost anyone can relive those wonderful memories right in their own backyard. Outdoor fireplaces, fire pits, and fire pit tables are great ways to add enjoyment to your backyard party or quiet evening alone. Whether you invite the whole gang for a get-together or enjoy a romantic evening star gazing, your outdoor fire will help enhance the evening. Outdoor fireplaces also extend your outdoor season by allowing you to enjoy your yard and patio long into the fall and winter months. This is especially good if you live in a climate with shorter summers. When the days grow shorter as the sun sets earlier, get more time outside by utilizing an outdoor fireplace or fire pit. A cool crisp evening with a cup of hot chocolate or mulled cider can be invigorating. Bring out the kid in you by roasting marshmallows and making s’mores! 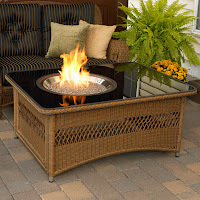 These backyard fireplaces can be as simple as freestanding outdoor fire pit tables and as elaborate as full scale outdoor fireplaces. There is a wide variety of styles and price ranges to select from. 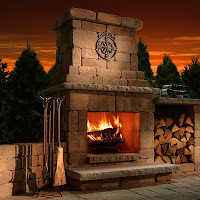 Outdoor fireplaces are similar to indoor fireplaces with the heat radiating out from one side, whereas outdoor fire pits radiate heat all around. The possible hazards of an open fire are obvious. Use precautions to ensure your fire is not putting any structures at risk. No matter what kind of unit you decide to purchase, always check with your local building and fire inspector for town requirements. Whether you want the ability to cook your meal or you just want to feel the warmth of a fire, there is something for everyone. Don’t be confined to using your outdoor space only during traditional warm weather, increase you enjoyment by using it all year round with an outdoor fireplace or outdoor fire pit.